Regardless if you are planning to install carpet, vinyl, ceramic tile, natural stone or a laminate floor, the concrete base needs to be flat, if not level, before you can begin the installation. Smoothing down a concrete floor may seem like a daunting task, but the reality is that it's a fairly straightforward process that you can complete with a variety of different tools. While not necessarily difficult, it is a dusty and dirty task, but once you are finished, your floor will be ready for whatever installation you need to use. 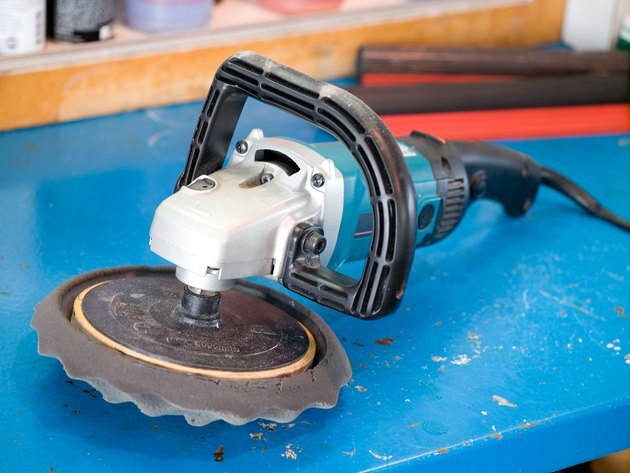 There are numerous tools you can use to smooth a concrete floor. Open any windows or doors to the outside in whatever area you need to prep. Seal off any doors to lived-in or worked-in areas with plastic sheeting. Cut the sheeting to overlap the doorways by at least 6 inches and use masking tape to hold the plastic in place. Seal the entire doorway with tape and plastic. Grind down small humps or rough spots with a hand-held cup wheel grinder. These come in 4-inch and 8-inch options, and you can use whichever size is most appropriate for your project. Hold the grinder firmly in both hands and let the weight of the wheel guide the machine. Pull the trigger and move the cup wheel over the high spot until it is removed. Smooth the ground-out area with a floor grinder or a cup-wheel grinder, depending on the size of the area and your personal preference. The machines work in much the same way, with the exception that you work the floor grinder while standing up. Hold onto the two handles, pull the trigger and let the weight of the machine guide it over the rough spot. Top coat the concrete floor with a self-leveling patch in the cases of excessively rough or warped floors. Mix it in a bucket according to the manufacturer's directions using the drill and paddle. Pour it into the low spots on the floor and use the trowel to smooth it over the surface. It will naturally level itself and leave a smooth, finished surface.